It's June, the very last month in the 6-month Penny Sampler. This month I have a few paper pieced blocks to make and then the final assembly!!! 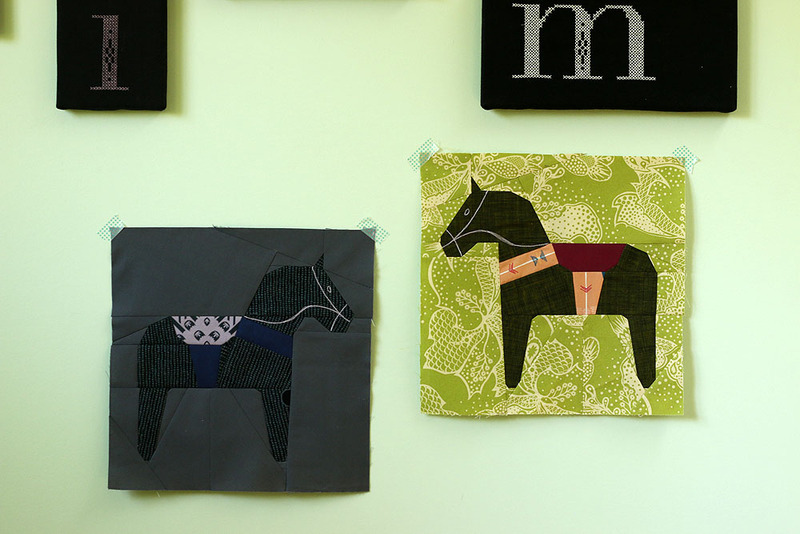 I decided to start with one of my favorite elements of the quilt, the dala horse blocks. These blocks mark my 4th and 5th go around with this pattern. You can see the other, more colorful versions in my pattern shop, since I offer Dala Horse as a stand-alone pattern. As today's blocks are part of a whole, the colors had to be carefully selected to fit the context of my Penny Sampler. Honestly, I think today's versions look kind of "meh" alone, but hopefully they do suit the quilt itself. Can you spot my mistake? The mossy green horse has a subtle error that I didn't notice until it was completely finished. Nope, I'm not fixing that! It works for me. Now I have all the blocks for this bottom row. Time to stitch them up so they'll stop flying around my sewing room! Joined blocks are SO much easier to manage. I hope to finish this quilt top this weekend. Fingers crossed!